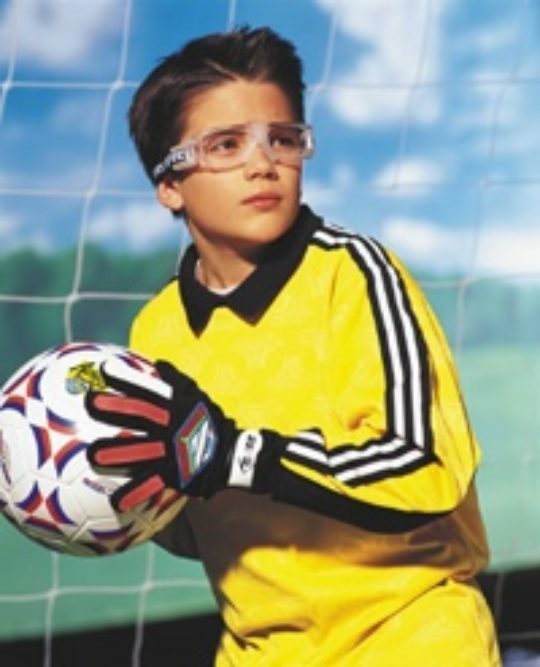 How do I protect my eyes while playing sports? Americans love sports and they love to look fashionable. And we oftentimes insist that sports and fashion go together, sometimes to our own detriment. For while protective eye gear may never be the latest craze in tennis or baseball, think for a moment about the logic of not protecting our eyes. We wear helmets to protect our heads and pads and braces to protect our bones and joints, so why not take the extra step to protect our eyes? We take extra steps to prevent concussions, broken bones, bruises and chipped teeth, but what do we do to prevent the possibility of permanent vision loss, a scratched cornea or fractured eye socket? Broken bones and bruises will heal, but a serious eye injury can put you on the disabled list from your favorite sport for the rest of your life. The ways in which an unprotected eye may be injured in a sporting event are too numerous to count. But the ways in which we can protect our eyes are simple and straightforward. It is especially important that children who are learning to coordinate or who have low skill levels wear protective eye gear. To reduce the risk of a serious eye injury, the following precautions should be taken when playing. In the event of an errant pitch, a ball lost in the sun or a thrown bat, a baseball player should wear a face guard made of a sturdy plastic or polycarbonate metal material along with eye goggles or eye guards. Basketball players should wear eye goggles at all times in the event of an errant elbow, a stray poke from another player’s finger or even an errantly thrown basketball. Like other contact sports, an errant elbow, ball, foot or finger can cause serious damage to the unprotected eye. Players should wear sports eye guards and, in football, a full face guard should also be worn. Ever get a good look at a hockey player’s teeth? Imagine such damage to your eyes. Sticks, pucks and elbows all fly freely during a hockey match, and a player should wear a full polycarbonate material or wire mask to prevent eye and other possible facial injuries. To protect your eyes from an errant or misjudged ball, or (in the case of racquetball) your opponent’s racquet, protective eye goggles should be worn at all times while playing these sports. How do I know my eye gear will be effective? Regular reading glasses, sunglasses, and sometimes even safety glasses don’t provide necessary eye protection for sports participants. Athletes need to purchase sports eye guards that are tailored to protect the eyes while playing the specific sport. Prices for the correct safety sports eye wear vary. Purchase eye guards at a sports store or optical store and have someone familiar with your eyesight and the sport fit you for the eye wear. Don’t purchase eye wear that doesn’t contain the correct lenses. Lenses should be secure because with many demanding sports, there is a chance that a lens may pop inward, which could cause scratching or damage to the eye. Eye guards should contain cushioning along the eyebrow and the edge of the nose to help prevent the athlete from cutting or damage to his or her face. How will protective gear affect my sports performance? Because the eyes help an athlete determine timing, coordination, and speed, the ability to see well while protecting vision is of utmost importance. Fortunately, many sports eye wear manufacturers today take into account an athlete’s activity, along with environmental factors, to create eye wear that will give players an edge in their chosen sport. Also, if the sport is being played outdoors, it is very important for athletes to wear eyeglasses that contain UV protection for sun ray blockage.